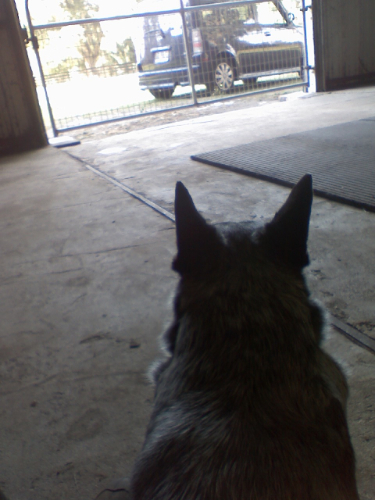 If you’ve ever spent time around a Blue Heeler aka Australian Cattledog then you know the one thing they live for in life is to WORK! Now that work can be lots of different things. It’s best for the owner to decide the dogs work rather than the dog since sometimes they don’t make the wisest choices when bored. When Eva (#1 dog) was a pup she decided her job was to make CindyLou (mutt of 5 lbs.) squeek at every opportunity. Not so good. Now that Eva is a mature nearly 7 year old she holds down a few job positions in our family. She makes sure to always know where my knees are, no matter where we are or what we’re doing. Nice to have her with me but not so nice when I trip over her! Eva makes sure the kitten, Evinrude, behaves and she does that best by poking him with her nose. She makes sure no other canines get close to our refrigerator. Eva makes sure when in the car no one else would ever think of approaching said car. When she feels the opportunity to get away with it, she makes sure the neighbor dog knows she will kill him if ever given the chance. 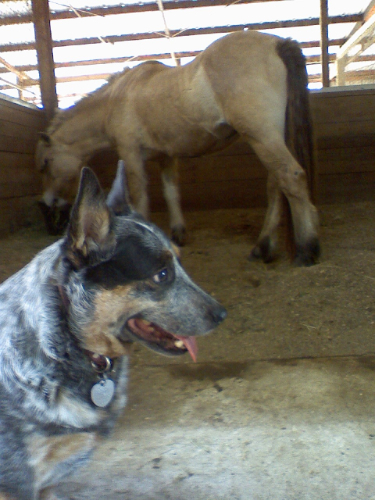 But her all-time favorite job is being a barn dog. It’s been a few months since she’s been able to go to the barn. Every time I am about to walk out our front door she gives me the look, “am I going? !” I tell her on the days she doesn’t go, she’s in charge at home. Yesterday as soon as I put her collar on she knew she was indeed going! WhooHoo! Eva and Cass have a wonderful relationship. I can leave the stall door open, Eva can go in and out and there is no danger Cass would ever stomp her. Becca, on the other hand, has stomped Eva. Just the difference in personalities. Thanks to all our intense training when Eva was a puppy (thanks Therese / Dogs Unlimited) I have control over this dog. She listens to me which is what keeps her safe. 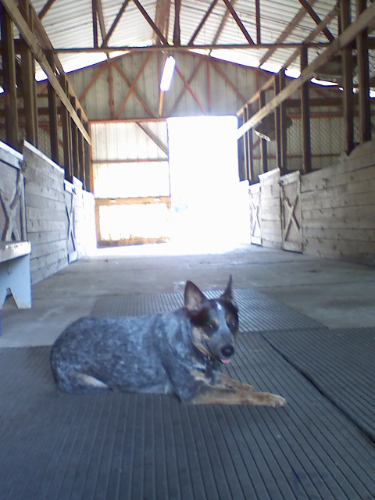 I can put her in a “sit/stay” at the front of the barn, let the horses in from the back and she will wait there until they are in their stalls. She takes her work seriously. I love having her with me. She is beautiful and looks like a perfect mix of my Oreo and Blueberry (who also know exactly where my knees are, guard the car from passersby, and relentlessly keep airplanes from landing in the yard).